WalkingLab’s Stephanie Springgay and Sarah E. Truman will give a public lecture at Concordia University’s Center for Sensory Studies. Queering the format of a walking tour, Stone Walks Lancaster will include ‘pop-up’ lectures and artistic interventions into the name/place/concept ‘Lancaster.’ Approaching topics from a queer, feminist, Indigenous and critical race framework, the walk takes up the theme of Lancaster obliquely. Topics range from the Lancaster Bomber, the Lancaster Treaty, the Sims speculum from Lancaster South Carolina interrogating militarism, migration, settler colonization, Black diaspora, free market capitalism, sinkholes and speculative geology. 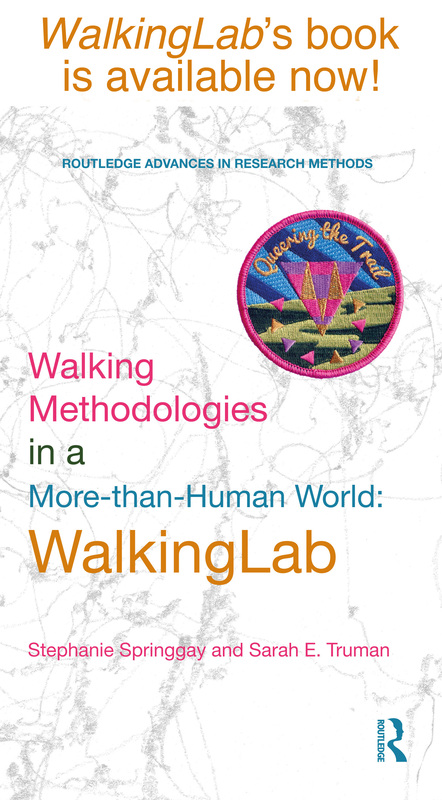 WalkingLab‘s Stephanie Springgay and Sarah E. Truman and colleagues Kimberly Powell, Margaret Somerville, and Michael Gallagher will present on a symposium in the Qualitative Research Sig entitled Walking Methodologies in a More-Than-Human World. Indelible Refusal is series of public lectures, panel discussions, film screenings, workshops, artistic walking interventions, performances, and master classes aimed to actively engage in pedagogies of refusal and solidarity. The program aimed to walk-with and think-with Indigenous, Black, 2 spirit, queer and trans artists and scholars to work through concepts related to land, settler colonialism, slavery, erasure, violence, and refusal. Presented by Jackman Humanities Institute Arts Program and WalkingLab. WalkingLab’s Stephanie Springgay and Sarah E. Truman will give a public lecture to launch the book. Stephanie Springgay and Sarah E. Truman of WalkingLab will give a Keynote introduction at the European Congress for Qualitative Research for Ali Madanipour. Their lecture will examine walking methodologies as counter-cartographies and as affective time. Meeting Place: Ross Fountain, located in West Princess St. Gardens, Edinburgh. Please dress for the weather and wear walking shoes. The concept of ‘Deep time’ was developed by Scottish geologist James Hutton (1726-1797), and coined as a term by the American author John McPhee. Hutton posited that geological features were shaped by sedimentation and erosion, a process that required timescales much grander that the arc of human history. Deep time displaces the human from conceptualizations of time, while the current crisis of the Anthropocene alarmingly re-centres it. WalkingLab’s event: Stone Walks Edinburgh: Queering Deep Time unsettles such understandings of time, investigating other ways of ‘thinking-with’ time, that entangles geos, bios, and Land. Queering Deep Time, performs as a walking tour through the city of Edinburgh, rupturing linear time through ‘pop up lectures,’ performances, and artistic interventions. The walk considers time as out of joint, relational, and material. Stephanie Springgay and Sarah E. Truman will have a one artist month residency at Listhus Artist Centre in Olafsfjordur, Iceland to continue with their research on rocks as queer archives. WalkingLab collaborator Dylan Miner will lead a walk his walk entitled ‘To the Landless.’ ‘To the Landless’ asks people to join together on a casual walk through Chinatown and Kensington Market, traveling from Gallery 44, 401 Richmond Building, toward Goldman’s former house on Spadina. During the walk, we will imagine Gonzáles Parsons joining Goldman, who died in Toronto in 1940, for dinner near her house. Unable to separate history from the present and future, Miner asks us to walk with, converse with, and eat with the ideas of these two contentious and important activists and thinkers. By doing so during this provisional action, we will visit with Lucy Gonzáles Parsons and Emma Goldman and discuss contemporary conversations on the politics of settler-colonialism, capitalism, patriarchy, and immigration. Click here for more details. WalkingLab’s Stephanie Springgay, Kimberly Powell, and Sarah E. Truman will give papers about WalkingLab on two panels. WalkingLab’s Stephanie Springgay and Sarah E. Truman will deliver a paper about WalkingLab in the session Quantitative and Qualitative Methods are not Enough! The Ethics of Research Beyond Methodocentrism. The 3 ½ hour loop trail will be activated by ‘pop up’ lectures and artistic interventions. Presentations by: Dr. Katherine Wallace, University of Toronto (Geology); Dr. Kaitlin Debicki, McMaster University (Tree communication, Indigenous Knowledge); Randy Kay, McMaster University (Squatting and occupation of parklands); Dr. Bonnie Freeman (Indigenous Journey Methodology on Foot); TH&B Art Collective, Hamilton (Artistic Intervention); ALSO: Earn hiking badges and pennants by artist Mary Tremonte. Co-sponsored by Hamilton Artists Inc. Visit the blog post for more information. WalkingLab’s Stephanie Springgay and Sarah E. Truman will give a paper at at The 7th Annual Conference on the New Materialisms, in Warsaw. The paper: Stone Walks: Inhuman animacies and queer archives of feeling draws from their Stone Walks research at WalkingLab. Stephanie Springgay and Sarah E. Truman will give a lecture at St. Paul Street Art Gallery, Auckland, NZ and discuss WalkingLab and walking methodologies that attend to transmateriality, affect, and Land. This symposium offers experiential opportunities for scholars to participate in two walking excursions designed to activate our senses: a food tour and a food forage. We will use these to discuss sensory and mobility methods, analytic vocabularies and research fieldnotes. An audio walk that combines mindfulness practice with doing the laundry in an attempt to explain the interconnections between the service economy, emotional capital, and affective labour from the perspective of the artist’s exceptional labouring body. March 24 at 7:00 p.m.
WalkingLab’s Dr. Kimberly Powell, is giving a lecture on her work in San Jose’s Japantown (CA), an area affected by the Japanese American internment experience of World War II. Palmer Lipcon Auditorium, Palmer Museum of Art. WalkingLab Research Assistants Sarah E. Truman, Tanya Pauli-Myler, and Carly Smith will present papers on December 3rd in Fremantle Australia at The Australian Association for Research in Education Conference. WalkingLab and HPU are teaming up to run a 3-City-Strata-Walk. With a list of prompts we will walk Victoria Street in 3 different cities and stratgraphically map the different layers of meanings, stories, and systems that make up a place. WalkingLab’s, Sarah E. Truman is beginning a 100 km walk along St. Cuthbert’s Way and documenting her research using postcards from strangers. WalkingLab’s, Sarah E. Truman is beginning a 3-month in-school research project focused on walking and writing with grade 9 students in Cardiff, United Kingdom. WalkingLab’s colleagues, Hamilton Perambulatory Unit hosted a Yule “walk” instead of a Christmas “Drive” to support the Native Women’s Centre of Hamilton, Ontario, Canada. Dr. Hickey, Dr. Phillips, and Dr. Springgay will present papers on December 1st in Brisbane Australia at The Australian Association for Research in Education Conference. Walking Borders is an arts activist project led by arts activist Scotia Monkivitch that utilised metaphor to provoke attention for refugee and asylum seeker rights. Gravel-laden boats were placed in continuous lines along imposed borders of restricted and declared zones of Brisbane’s CBD during the G20 in November 2014. The project explores the lived and metaphoric experience of enforced borders, civic engagement through walking as activism and the relational, corporeal and sensory experience of walking as arts activism. Documentation of Walking Borders involved experimentation with visual recording devices strapped to walking bodies, and recording environmental and bodily traces of walking. Co-Sponsored by CMagazine & Hart House. Participants engaged in a three day workshop exploring embodied movement and GPS mapping throughout Toronto. 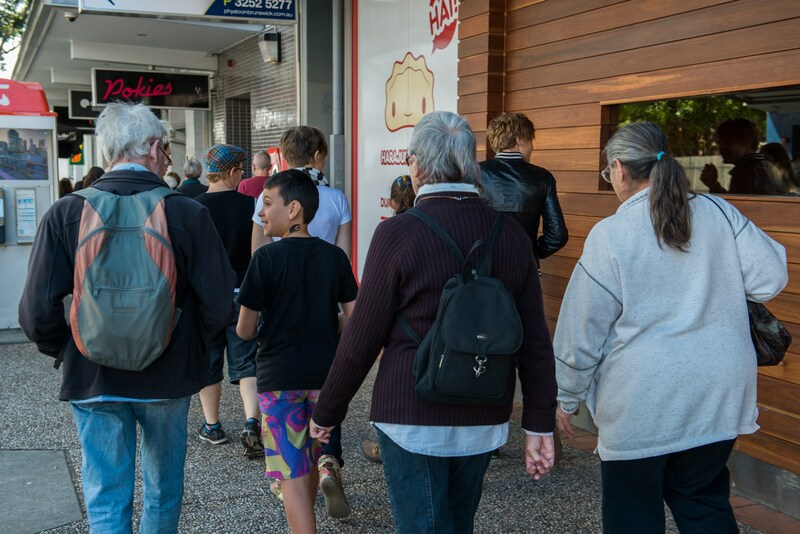 The Walking Neighbourhood is holding a series of events in September, 2014, in Sydney, Australia. For more information visit: Art and About Sydney’s website.